Broadcast is our digital signage solution built just for libraries. It allows you to turn any device into an interactive digital sign. Broadcast works across a range of common devices. Just download Communico’s Broadcast app and you can use any Amazon, Android, Apple or Windows device to power your digital signage. From Broadcast's central dashboard your playback reports will show you which screens are live and the content they are displaying. "The Communico Broadcast tool allows us to target our messages by location with just a few simple clicks.  We have been impressed by how much more quickly and easily we are able to deploy content now that we use Communico." 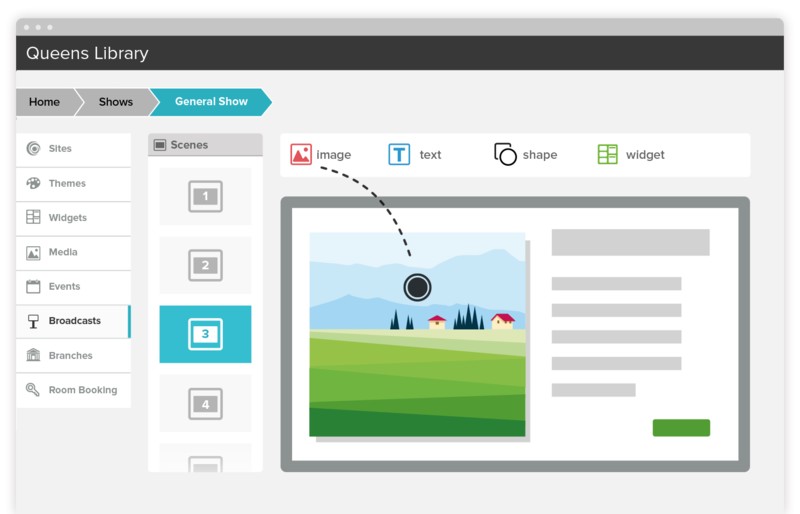 Use the built-in templates and drag & drop editor, or export content from your favorite desktop publishing program. Make content changes and see them update in real time across devices. Use Communico Connect to pull information such as book jackets and descriptions from external websites. When you register a screen within Broadcast you also record its branch location. This allows you to use Broadcast’s Smart Shows and Smart Widgets within your channels. Smart Shows allow you to have a base show which is shown in all branches and then you can append additional beskpoke scenes for individual branches. Widgets allow you to build scenes within Broadcast which graphically look the same but display different data at different locations. 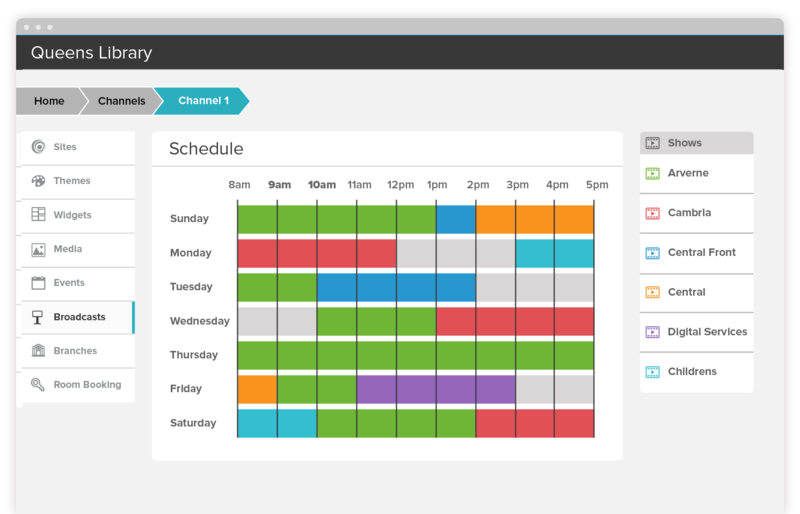 From the control panel it’s easy to schedule when and where your channels are displayed. Broadcast's scheduling works in the same way as the program guide on your TV. The flexibility allows you to vary content as the demographic of your patron changes throughout the day.